Silence speaks when words cannot. One of the most magical moments of the day in Vienna is 7 pm when the bells throughout the city start to ring. Their ringing times are slightly off-set so that as the baritone clangs of one church begin to fade, the ringing tones of another commence. No matter how many years I live here, I never tire of that sound and it is something I truly miss when I’m away. 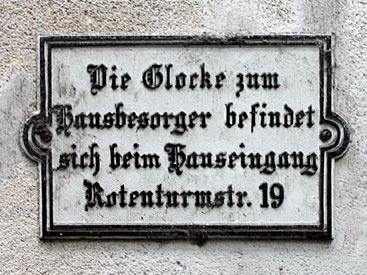 This door bell didn’t fly to Rome, she’s at the entrance of Rotenturmstrasse 19. And for the past few days, I have missed them once again. Because wouldn’t you know it — in Austria (Germany, France and perhaps more parts of Europe), the bells pack up their things on Maundy Thursday (Holy Thursday) after the service commemorating the Last Supper, and all fly to Rome not to be seen or heard from again until Easter. 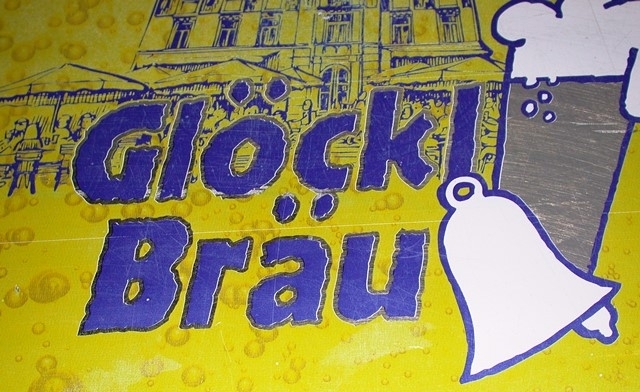 The Glöckl Beer of Graz probably doesn’t fly to Rome either. Perhaps in a show of a solidarity, or unwilling to work when the others aren’t (maybe a union thing) or maybe just a bit depressed but for whatever reason, when the bells fly away, the organs all take a hiatus too. But they don’t spread their organ wings and lift off, they just give everyone the silent treatment while the bells are gone. And though I might often times enjoy the sound of silence, I also recognize that historically, before iPhones and Smart Phones and reminders and ring tones, bells served an important civic function. Back in yesteryear, it took a bit for pocket-sized watches to be inventedand not everyone could afford one. And try lugging a sundial with you to the pub. For this reason the church bells would inform folks where the fires were, when public entertainment events like executions were taking place and when they better get themselves back home to the wife from the pub. 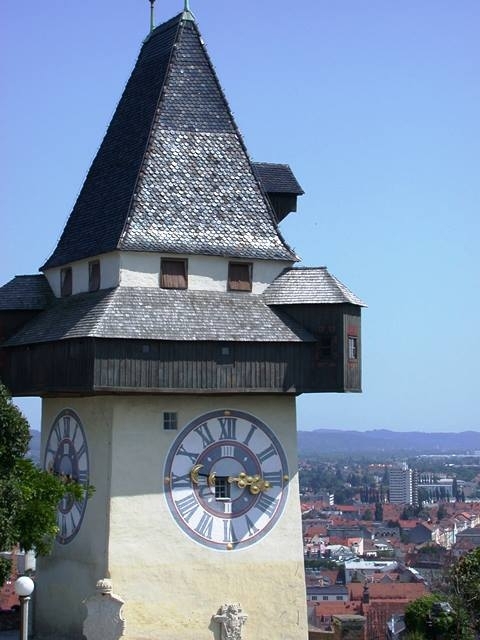 The three bells in the Graz Clocktower probably took off for Rome too. The Hourly Bell (Stundenglocke) that rings on the hour, every hour; the Fire Bell (Feuerglocke) that would vary its ringing according to the district of Graz that had a fire and the Poor Sinner’s Bell (Armensünderglocke) that around 1450 marked when someone was being executed and in the 1800s became the Closing Time Bell (Sperrstunde Glocke) marking the closing of hour of the surrounding pubs (was he in for a serious sentence from the wife if he chose to ignore is? Something satisfying about it having once been the executionar bell). So the function of the bells had to be replaced while they were absent and who better to do the job than the unpaid volunteers who have no authority to protest? Yep. Come on stage, altar boys and girls. Cause you will be working your rattles, large and small, in place of those bells. But it’s not all slave labor for the boys and girls. They are often rewarded for performing this public service with Easter eggs, chocolate or other small culinary tokens of appreciation. Rattle (Ratschen) played by the altar boys and girls while the bells vacation in Rome. 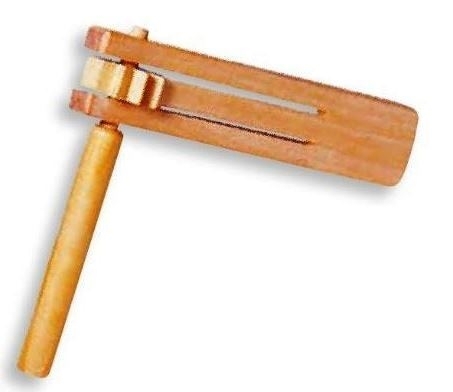 Meanwhile the bells remain silent throughout the three climactic days of the Catholic calendar – the Triduum Sacrum, the “Holy Three Days” which include the Last Supper on Holy Thursday, the suffering and Crucifixion on Good Friday, and the Resurrection of Jesus on Easter Night. As I write, the bells have returned again to their proper home and are ready to ring for me again for another year. Good to have you back home again! Pummerin Bell in Vienna’s St. Stephan’s Cathedral. 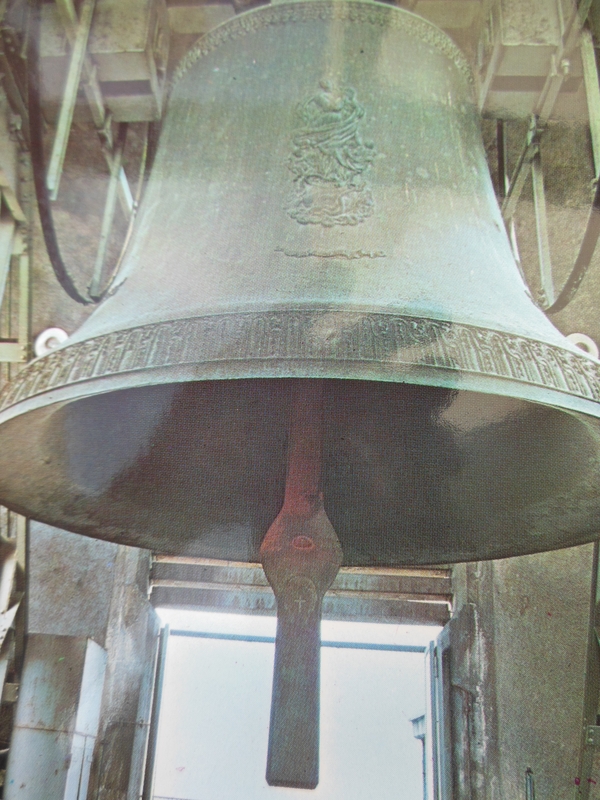 She hangs in the north tower and is the third largest bell in Europe and the fifth largest in the world. She only rings on particularly religious holidays and on New Year’s Eve (cause she’s a bit of a party girl).